The next two penguins I would like to introduce to you are Benguela III and Agulhas III. First up: Benguela. 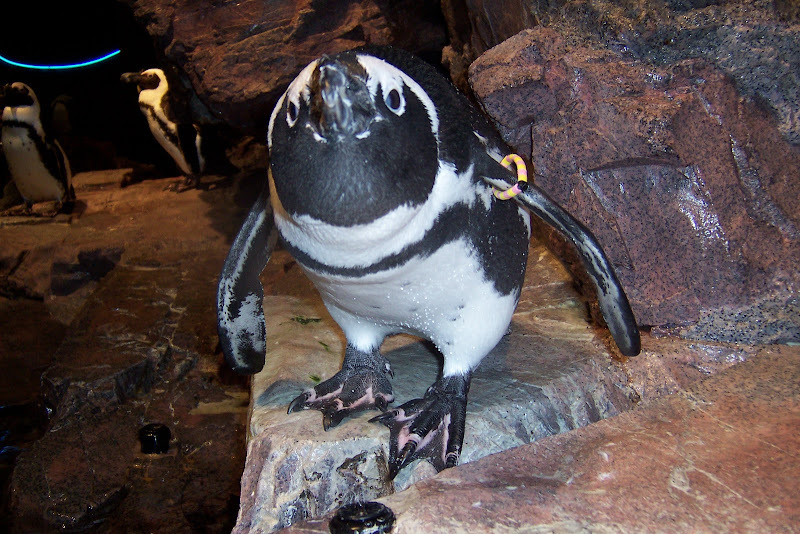 He has a pink and yellow bracelet on his left wing and he was born here at the Aquarium on May 23, 2001. He is currently paired with a penguin named Bird (yellow and pink bracelet on the right wing). 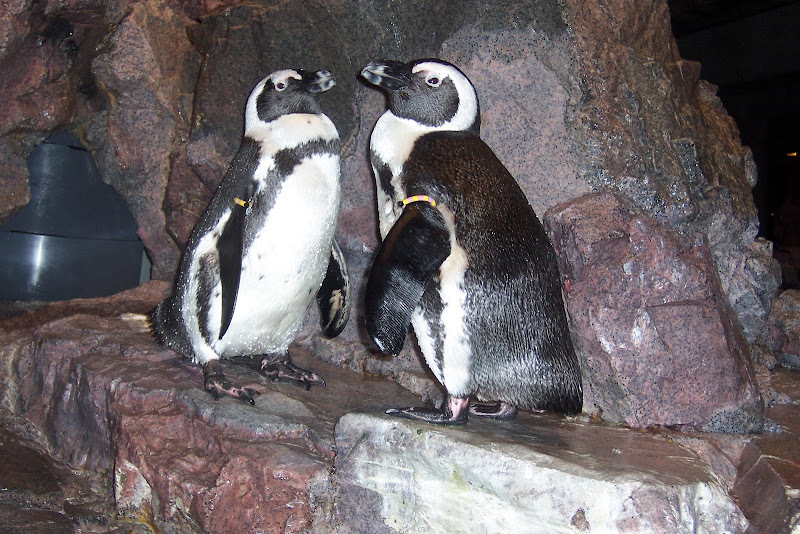 Together they have been successful in raising four penguin chicks here at the Aquarium: Sinclair II, Pikkewynne, Dyer III and Pilchard. Now, Agulhas was born on June 7, 2010, and his parents are Seneca and Isis. He has an orange and grey bracelet on his left wing and still has his juvenile feathers (solid grey feathers on his head). I wanted to introduce these two penguins together because they are both named after ocean currents that flow around the southern coasts of Africa. The cold Benguela current flows north and northwest in the South Atlantic Ocean along the west coast of South Africa, while the warm, south flowing Agulhas current flows from the South West Indian Ocean along the east coast of South Africa. Both currents supply nutrient rich water an area of high productivity, which supplies food like pilchards for the African penguins that breed along the west coast of South Africa and Namibia and the southeast coast of South Africa. 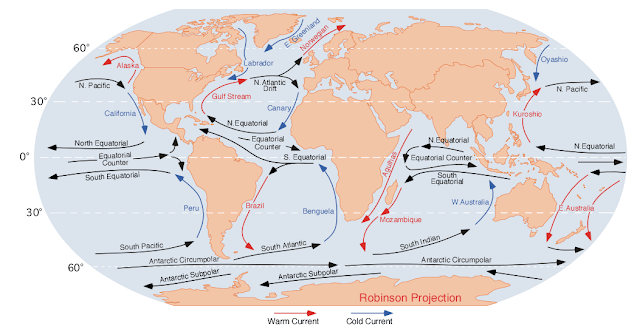 Map of major ocean currents found on PhysicalGeography.net. RED arrows indicate warm currents, while cold currents are displayed in BLUE. Recently the paths of these currents have shifted farther away from shore resulting in the penguins' food source moving farther away from their breeding areas. As a result parent penguins may not be able to return from foraging with enough food to sustain themselves and their chicks waiting to fed in the nest. Not only do these currents support the African penguin population but they are important to many other marine organisms, from sharks and seals to the inhabitants of coral reefs along the coast of Mozambique. This shift in the currents will have a major effect on many marine ecosystems and could be attributed to global climate change. To learn about things you can do at home to help stop global climate change, check out the live blue™ Initiative or peruse these links.